Oil in the sight tube. The owner’s manual recommendeds two specific brands of oil – made by IP and Agip – and both are semi synthetic, though any oil matching the above specification will be fine. Oil is one of those subjects that divides opinion – some riders swear by fully synthetic oil and say they have used it with no ill-effects. Once the bike is run in this may be the case. However, Aprilia UK received several warranty claims for slipping clutches on their 1,000cc Vee twins and refused to pay them when the owners disclosed they had used synthetic oil. Aprilia UK judged that the owners had invalidated their warranties by using synthetic oil. So you can use fully synthetic if you wish, but you do so entirely at your own risk. Thanks to the engine’s dry sump, this isn’t the easiest of jobs. First of all, the bike needs to be hot – not just warm, but hot. A good half-hour ride should do it or get into the habit of checking the oil after a ride. Then you should be able to see the oil level in the sight tube on the left hand side of the bike. If you can see oil in there, then it’s okay. The tube holds less than 200 ml of oil. Do not give in to temptation to fill the oil to the top of the sight tube – these dry sump Aprilias don’t like too much oil and have a tendency to spit out the excess into the airbox if you add too much. The oil catch tube under the airbox. 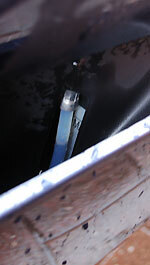 Oil collects here if you overfill it.The oil level likes to be in the bottom half of the sight tube. Some owners have got into a vicious circle of topping up the oil to max every week, only to realise the airbox has been filling up with oil. There is a drain tube (shown right) for the airbox which is fitted with a bung and this needs checking and emptying once in a while. These engines do use oil so a little oil consumption is generally nothing to worry about. The dry sump arrangement means the oil level can get pretty low without doing any damage. Just don’t rely on this. You’ll need to remove both left hand panels and the plate the regulator/rectifier sits on to gain access to everything you need. There are two drain plugs, one at the bottom of the oil tank and the other on the engine, to the right of the oil filter chamber cover. If your bike still has the standard exhaust, be aware that the engine drain plug and the oil filter chamber tend to dump oil all over the pre-silencer, which will burn when you first fire the bike up unless you clean it off. This engine drain plug is an allen key bolt and can easily round off, so make sure you use a tight fitting key and it’s pushed well into the socket. It’s also magnetic and needs a clean before replacement. The two oil filter bolts come out easily enough, and remember to note the orientation of the filter for when you install the new one. The filter chamber can go back on either way. Just be sure the o ring seats properly. Re-assemble the whole lot, being very careful with the oil tank bolt as it’s easy to overtighten. After an oil and filter change the bike takes 3.7 litres of oil (with original oil filter chamber). The sight glass will be full to the top at this point, but as soon as you start the bike it will drop as it charges the oil filter chamber. * Don’t overfill eg 3.5 -3.75 l ; then run till warm ; then check. 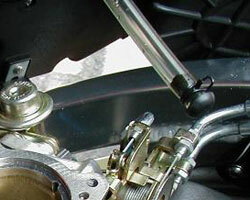 For a fuller guide, including torque settings, see Ken’s Falco site. 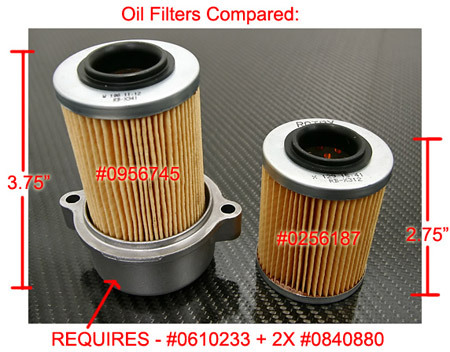 Early in 2008 Aprilia issued a service bulletin to dealers telling them to fit a new, larger filter to all 1,000cc Vee twins. The new filter requires a new chamber and longer bolts, which the owner has to pay for – it’s not a recall or a warranty fix. It’s not clear why Aprilia has done this, as there doesn’t seem to be a problem with oil-related failures in the Rotax motors, but according to anecdotal evidence it’s better to source your own bolts, rather than use the Aprilia-supplied ones. Especially if you’re in the US, all the parts can be had from AF1’s online shop, otherwise they are available at your local Aprilia dealer. Rear shock – rebuild or replace?